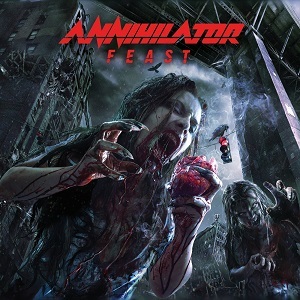 Annihilator are back with their fourteenth studio album - Feast. The Canadian band, led by Jeff Waters have been going since 1984. The album is a 2 disc one, with the discs being very different. The first disc is the new album - nine new Annihilator songs, while the second disc is a collection of older Annihilator songs that have been re-recorded. To throw in a fifteen track collection like this in with the album is very generous - there are plenty of other bands around that would have just released the second disc as a standalone album to maximise the money they make, but Annihilator have thrown it in for free. Why re-record them? Well, the songs are taken from the albums released before current singer Dave Padden joined in 2003, so they've been re-recorded with the current singer and to make them more widely available to newer fans. Arch Enemy did a similar thing with their 'Root of all evil' album except they released the album by itself rather than bundling it with the latest studio album. I've been listening to the album quite a lot in the last few weeks, so when I got to see the band's superb set at Wacken Open Air, even though it was my first time seeing them play live, I knew most of the songs - 2 from the new album and 6 from the Re-kill disc made up 8 out of the 11 songs they played, so for that reason alone anyone planning to see the band on tour should get this release - especially since on tour they'll probably include more songs from it that they couldn't fit into a festival slot. So, onto the Feast album itself. Well as with all Annihilator albums, Jeff Waters has written it based around the guitar riffs, so unsurprisingly there are some excellent riffs here meaning the songs sound fast and heavy. Throw in some great solos and pounding drums along with the vocals and you have a great thrash album here. One track that stands out though is 'Perfect angel eyes'. The reason for that is that this is a fairly rare song from Annihilator - it's an acoustic ballad written by Jeff for his partner. You might feel that ballads have no place on a thrash album, but listening to the album I have to disagree - a single ballad works well as it fits in nicely, breaks up the album and means that the power and force of the thrash feels like it's doubled when you get to the song after the slower quieter ballad as when you're listening to an album full of loud fast songs they start to lose some of their impact, whereas slower quieter songs help refresh that power and intensity. It's a great album and one that I'd definitely recommend to thrash metal lovers everywhere. 'Feast' will be released on 26th August 2013.